On July 26 Los Angeles County Assessor Jeff Prang has certified the annual Assessment Roll for 2018, which indicates growth in real estate and business property values, as well as in tax-saving programs. The roll’s gross value of $1.57 trillion, the $1.51 trillion net value, and the $80 billion in business property have set new highs for the county, as have tax-saving exemptions, which topped $59.8 billion. The leading indicators in this year’s Assessment Roll are sales and other transfers of real estate, which added $47.6 billion to the roll as compared to 2017, and new construction, which added another $11 billion. The combination of these and other factors yielded a net increase of 6.62% over the prior year – the greatest growth in values since prior to the 2008 recession. However, the Assessor also emphasized that the average growth in assessed values across the county does not mean property owners will be subject to a corresponding increase of 6.62% in their property tax bills. Existing homeowners will see only the standard 2% annual adjustment for inflation, pursuant to protections set out by Proposition 13. In addition, Assessor Prang’s proactive efforts to promote savings for seniors, veterans, disaster victims, and homeowners has resulted in tax reductions for over 1 million homeowners. This year alone, the Homeowners’ and Disabled Veteran exemptions will exempt $7.74 billion from taxation, saving taxpayers $77 million. Savings by non-profit, community service, and faith-based institutions, schools, museums, libraries, and hospitals will see a record $52 billion in exemptions, producing $521 million in savings. Another indicator of the growing economy and business optimism is the record-setting $4.53 billion (or, 5.9%) increase in business personal property. This reflects investment growth in equipment, machinery, and technology, as well as marine vessels and aircraft. Business property totals $80 billion in assessed value for 2018 and is therefore another new high for the county. 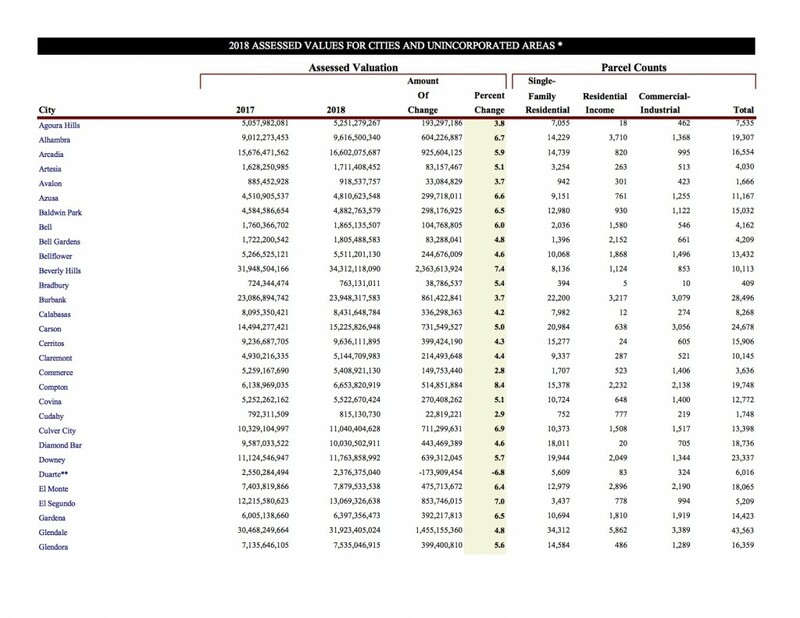 The 2018 Assessment Roll comprises 2.57 million real estate parcels and business assessments, including 1,874,588 single-family residences (including condominiums), 249,660 residential-income properties (e.g., apartment buildings), 248,198 commercial/industrial properties, and 205,204 business properties.